In 2015 I made a project called "The Price of Gold". I travelled through the Eastern Cape of South Africa documenting the miners who had become sick from working in the gold mines. This was the first time that I had visited much of the area known as the Wild Coast and I was completely blown away by the rugged beauty of these rural communities. I had been told about the mining projects that were being planned in the area and wanted to visit them to understand the extent of the damage that could be done if the excavations were given the go ahead. I had planned to go earlier but the tragic murder of the leader of the opposition to the mining, Sikhosiphi “Bazooka” Radebe, on the 22nd of March forced me to delay the trip. For an overview of the ongoing campaign against an Australian mining company, see the Postcards from Xolobeni project page here. Xolobeni is a large area made up of several small communities, a network of villages that hug the coastline. The nearest major city is Durban, 1.5 hours away on the main road, once you have navigated the network of gruelling dirt roads for up to 2 hours. Most of the homes have some electricity courtesy of small solar panels and there is cellphone reception on top of many of the hills throughout the region. There are few other modern luxuries and little access to shops and clinics, most of the inhabitants of the Xolobeni communities live a very simple, self-sufficient lifestyle. The land is used to graze cattle and sheep; grow corn, potatoes, bananas and a variety of other food. The nearby forests are carefully felled for wood with which to build and to burn for fuel; and the sea is an abundant source of fish, oysters, mussels and clams. Further to the food and fuel that the land provides, muti (medicine) is cultivated from various roots and plants; and the family land becomes the final resting place for many of the community's ancestors. The Local meeting where I was introduced to the community. My initial trip to the Xolobeni area was in May 2016. I travelled with Nonhle Mbuthuma*, the leader of the Amadiba Crisis Committee, an organisation set up to deal with the two major issues that threatened the welfare of the community; the mining project and the extension of the N2 motorway. Nonhle introduced me to the community and the leaders, helping to facilitate in getting me the required permissions to work in the community. Getting approval from the correct authorities and being introduced by a trusted ally are crucial steps in the process of working with a community that I am not a part of. Wherever I am in the world, there are expected way of operating that need to be respected. * In 2018 I photographed Nonhle as one of the environmental activists for The Defenders, a series that I made for The Guardian, Global Witness and the United Nations Environment Program. For this reason she is not included in the postcards project. Together with Siya Ndovela and Sibu Mqadi I travelled around Xolobeni for the next few days talking to people about the mining, taking some initial portraits and developing ideas about how we could best communicate the issues. An initial trip to any area that I am working in is a really important consideration. Not only does it give me a chance to get a feeling for the area, understand the light and get to know the issues that I am working on; it also is the first step in a very important process of trust building. I have found that there is no better way to breaking down barriers than a repeat visit. To be respectful enough to take time to talk to the people I will be photographing, explain the project, ask for their involvement, ask for their thoughts and then promise to return. On the return that promise has been kept, there is a recognition and a relationship that has been established and I am no longer a complete stranger. In keeping my promise to return, a small level of trust has been built and a good basis is established for the working relationship. Much better than approaching as a stranger and expecting to start shooting compelling images. It's also a simple matter of respectfully acknowledging each person, their time and their agency. Obviously it is not always possible to make an initial trip but I always make the effort to do so when time and budget allows. As soon as I left Xolobeni on that first trip I knew what I needed to do. 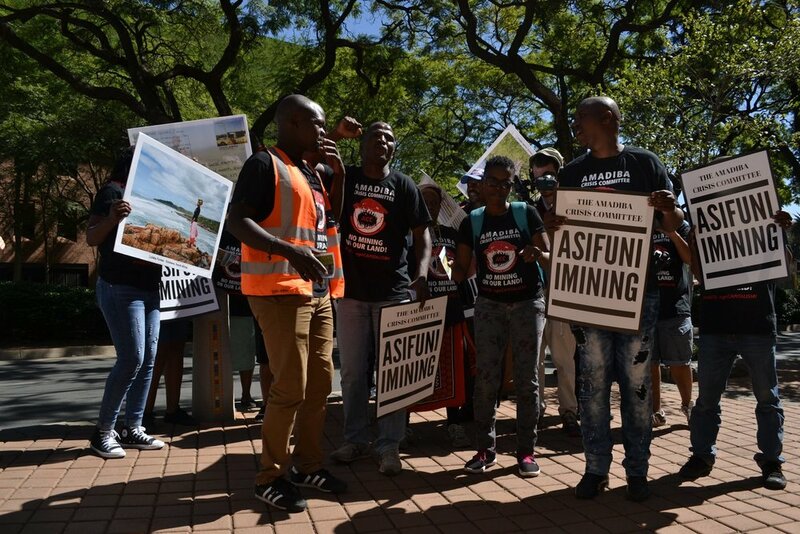 The most important factor in this fight was the people whose livelihoods were up for sale for corporate profit, the people of Xolobeni whose voices had been taken away. The postcard project was clear in my mind. I wanted to be able to print the postcards when I was in Xolobeni so I purchased a Canon Selphy CP1300 photo printer. I have owned one before but the quality was not good enough for what I needed. This new printer is fantastic and meant that I could print on location. It has a rechargeable battery and is small enough to carry with the rest of my gear. It also allows me to immediately give photographs to the people that I am shooting, this is always a nice way to say thanks for their involvement. Canon used to make Selphy printer paper with blank postcard backs, a space for a stamp and the address. These seem to have been discontinued so I made my own, printing out a template onto white card, cutting and sticking the photo paper and postcard backs together (such a glamorous job I have). I also needed a team of people around me to make sure that once the work was made it could be disseminated effectively. I was in contact with a few NGO's that were working in the area; Sustaining The Wildcoast, The Alternative Information Development Centre and the Amadiba Crisis Committee, as well as Johan Lorenzen, one of the lawyers from Richard Spoors Attorneys, the firm who were working on the legal case against the government. I let them all know that I was going to make the project and that once they were ready we would meet to decide how best to use them. Both of the trips were self-funded. I usually like to get backing from funding organisations before I start a project but it can be a very lengthy process and I felt strongly that the project needed to be made in time for the court case. After I finished the project I was lucky enough to be given funding for my expenses from the South African Development Fund for which I am extremely grateful. I stayed in the community for 10 days, working every day with Siya and Sibu to photograph as many opponents to the mining as possible. I wanted to show the wide range of ways that people are connected to the land, how they use it and what it means to them. Using a single light (Profoto B1 off camera strobe) and a large scrim (Lastolite SkyLite rapid) to block out the midday sun, the three of us battled the wind and rain to create a series of portraits for the postcards. After each shoot I hooked up my photo printer in the back of the car and made the postcards whilst we talked with each person about what they wanted to say. Postcards are small and only a small number of words can fit, a restriction that did not necessarily compliment the passion of our enthusiastic subjects. The local language of the area is isiXhosa, one of the eleven official languages of South Africa. Not everyone spoke english and, of those who could, fewer could write. This meant that Siya and Sibu worked hard to facilitate an accurate translation that each subject was happy with, making sure to double check in isiXhosa that it is exactly what they wanted to say. Where the person could not write this was done by another member of their family or, failing that, a member of our team. There were considerations to be made about whether the postcards should be written in isiXhosa. It would feel more respectful to the person in the photograph and it would probably more accurately represent what they wanted to say, no translation completely captures the nuances of the original language. After much deliberation it was decided that the postcards should be written in English. The aim of the project was to bring global attention to the issue and to do this we needed to eliminate as many barriers as possible from the communicating of the information. One of the audiences that we really wanted to target was Australian, to hold the mining company to account by their own people. With Australia being a predominantly english speaking country, it goes without saying that a message written in an African language that they did not understand would be far easier to ignore than one in English. The postcards are a mix of vibrant photographic images, illustrating the beauty of the land and the connection that the community has with it; coupled with simple and passionate messages that communicate the anger, fear and despair of the people. I made the project in time to coincide with the court case that was happening in Pretoria. The aim of the court case was to give communities the legal right to oppose companies that were wanting to exploit the land that they lived on. The "Right to Say No" campaign was conceptualised by the Alternative Information & Development Centre (AIDC), Sustaining the Wild Coast (SWC) and the Amadiba Crisis Committee (ACC). We wanted to put on an exhibition near to the courtroom, creating a place for the postcards to be read and photographed. Budget constraints meant that this didn't happen but some giant postcards were printed and paraded around outside the court. 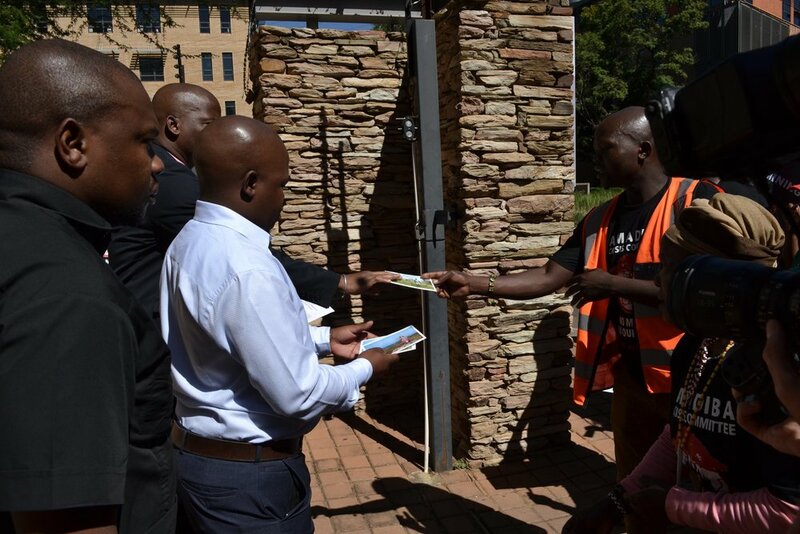 A set of postcards were also hand delivered to the minister of minerals and resources, Mr Gwede Mantashe. In Australia the postcards have been sent to Mineral Commodities Ltd. in Perth, the company who have been involved in the effort to mine titanium in the Xolobeni area. The delivery of these postcards was timed to coincide with the publication of the series in The Guardian. 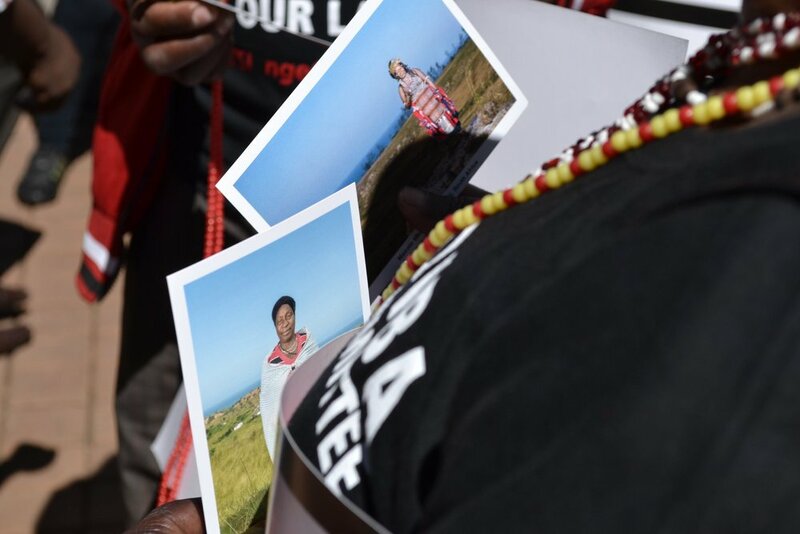 The postcards have also been made into a book which contains all 32 of the postcards with messages, plus a set of postcards with blank backs which can be removed and sent in support of the Xolobeni community. This project could not have been made without the collaboration of the Xolobeni Community. My thanks to them for giving their time so generously. Special thanks to - Nonhle Mbuthuma, Siyabonga Ndovela, Sibusiso Mqadi; Holly Shepherd and the South African Development Fund, Margie Pretorius, Sandy Heather, Grant Mcnulty, Andrew Bennie; Kea, Paula & Dominic at AIDC, Johan Lorenzen at Richard Spoors inc, Nicci Martin, Lucia Knight, Amadiba Crisis Committee, Sustaining The Wildcoast, Anso Thom, Allan & Elena at Mtentu Lodge. This project was made possible by the generous funding of the South African Development Fund.